To be honest, I did not know what to think when going into Creeps. The blurb on the back states that this book will appeal to fans of Thirteen Reasons Why and The Perks of Being a Wallflower. That is a tall order to fill! Both of those are very powerful reads that have a very strong fan base(myself included!) My main goal was to go into this book with an open mind, and not compare this novel to anything else. We are immediately introduced to Wayne's character and the awful bullying he is a victim of. Right away my heart went out to him. 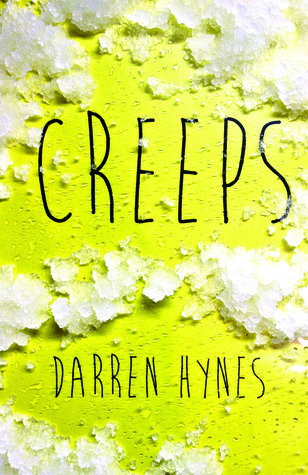 Creeps definitely stirs up the emotions inside of you. I was bubbling with anger when it came to Pete and his Posse, and that was only within the first few pages. It doesn't take long for the story to erupt. In it's short 320 pages Darren Hynes manages to make you laugh out loud, sob like a baby and grit your teeth with anger. Wayne and Marjorie's story develop at a great pace. And the author did a wonderful job at their introduction. As someone who was bullied, There were times when I could only handle this book in small doses. However, I could relate to Wayne and Marjorie on a close level. . Their stories buried themselves deep down inside me, and resurfaced some old emotions from myself. I wanted to open my arms and protect both of them. Shield them from that horrors that they were forced to deal with. On a lighter side, I loved the touch of the unsent letters. It is something unique that I haven't come across before. It added a beautiful element to the novel. I can definitely see why Creeps was compared to those 2 iconic novels. Because it does appeal to that Fan base. Strong characters, an equally heart-warming and heart-wrenching storyline and a powerful climax. Creeps will have no problem standing out on it's own! Being that Darren Hynes is a Canadian author, I couldn't help but burst with Canadian pride while reading his debut novel! He entered the young adult scene with a bang because Creeps definitely packs a lot of punch. It is definitely one that will stay with you long after you've turned the last page!